After advising members not to wear their Greek letters while protesting police brutality on Saturday, the first black sorority Alpha Kappa Alpha has changed their position—twice. As a follow up to several previous communications issued by Alpha Kappa Alpha Sorority, Incorporated® pertaining to the recent results of the Eric Garner and Michael Brown cases, as well as the communication sent directly to members this past Saturday via email and social media, it is important to provide further insight into the decision to post the last statement. Alpha Kappa Alpha Sorority expects our members to be socially active and the purpose of the statement last Saturday was to provide guidance as members peacefully and lawfully participate and exercise their right to assemble. 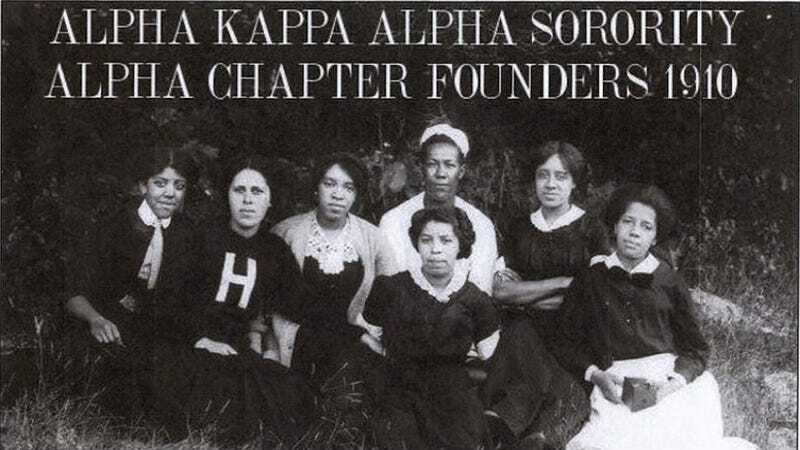 That message pertained to conduct and attire at protests and was not intended to prevent members from protesting and or lessen the sorority's support in seeking justice. In fact, the statement emphasizes that our leadership and many other leaders of the Divine Nine would like to be able to keep any messages that represent our organizations clear, concise and within legal guidelines. Further and most importantly, the statement was provided as guidance to ensure the protection and safety of not only the organization but of our members. At the end of the day, we want and need all of our members and their families to return home safely. For future reference, all Alpha Kappa Alpha Sorority statements are located HERE. As always, Alpha Kappa Alpha Sorority's leadership is open to us continuing a thoughtful and proactive dialogue that ensures that the organization drives long-term sustainable legislation, a more cohesive relationship with our law enforcement officials, and a better community for the next generation. An AKA insider contacted Jezebel on Thursday, adding that the newest decision did not come from a clashing of more "seasoned members" versus younger members. Rather Wilson listened to what members were saying across the country and age groups about their right to represent their organization while protesting and serving their community as they have been doing since Brown's death in August in Ferguson, Mo. In contrast, Delta Sigma Theta has not changed their position of banning members from wearing their letters while protesting. The decision is still not going over too well, as members are showing their Greek affiliation anyway and even speaking out against their own organization. Elsewhere, other Black Greek organizations like Alpha Phi Alpha and Zeta Phi Beta are encouraging their members to join the national movement not only in their colors but their letters. Calls for comment to the DST corporate office were unanswered at press time. Images via AKA, Kappa and Zeta websites, Facebook, Instagram, Twitter and an email obtained by Jezebel.